Travis Patrick Marinelli, 30, of East Sparta, died Tuesday, August 21, 2018 from injuries sustained in a motorcycle accident. A son of Patricia Marinelli Davis and the late Louis “Cook” Marinelli, Travis was born May 28, 1988 at Dover, Ohio. 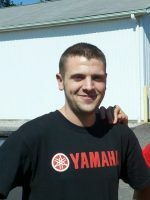 Travis was a graduate of UTI and worked as a motorcycle mechanic. He had a passion for motorcycles and anything else that had a motor. He is survived by his mother, Patricia; a sister and brother-in-law, Morgan and Matthew Graham; a niece, Reese Graham; a grandmother, Mary Marinelli; his girlfriend of 11 years who loved him very much, Nicole Mahaffey; special friends, Wes Brown, Rex Brown and Sam Sacconi; his faithful dogs, Peanut and Rocky; as well as many aunts, uncles, cousins and friends. Travis was preceded in death by his father, Cook and grandmother, Lillian Kulla.